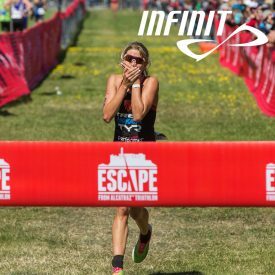 Cincinnati, Ohio, February, 5: Lauren Goss, professional triathlete, and INFINIT Nutrition, the original custom nutrition company, are excited to announce a new partnership for the 2019 and 2020 race seasons. Lauren, a 31 year-old professional triathlete from South Carolina, earned her professional card less than a year after starting her triathlon career. Since then, she has made it to the top of the podium in sprint, olympic, and 70.3 distance races, including nine IRONMAN 70.3 first place finishes. Lauren first tried INFINIT in 2018 after borrowing a fellow pro’s blend and liking how it tasted. Shortly after being introduced to the product, Lauren decided to try out a Custom Blend tailored specifically for her. So she worked with an INFINIT Formulation Specialist to come up with the perfect bike and running blends to really dial in her fueling strategy. Lauren’s Custom Blends were created specifically to match her training and racing needs; with calories, electrolytes, protein, flavor, and caffeine levels set exactly where she wants them. Her formulas were also designed to fit her vegan lifestyle, which is important to her since she switched to a plant-based diet back in 2017. Lauren’s bike blend (available to customize or purchase) includes a complete, well-rounded plant-based protein to help suppress hunger during long endurance efforts. Lauren’s run blend provides a natural and easy to digest source of energy and electrolytes, plus a boost of caffeine. Lauren will be fueling and recovering with INFINIT Nutrition during her training and racing, as she reaches for her goal of winning a podium spot at every race she competes in this year, starting with her first race, IRONMAN 70.3 Peru on April 14th. Lauren Goss grew up as a swimmer. She attended Clemson University (BS in Biological Sciences, 2010), and during that time did her first triathlon in July of 2009 in Charleston, South Carolina. Less than a year later, she earned her pro license in March of 2010 at the Collegiate National Championships and was named the 2010 Under-23 Athlete of the Year by USA Triathlon. She immediately began earning wins at races from sprint distance through 70.3. In 2017, she won five major US Olympic distance races: St. Anthony’s Tri, Escape From Alcatraz, New York City Triathlon, Des Moines Escape Tri, and the Lake Geneva Escape Tri. Learn more about Lauren at laurengoss.com, her Facebook page, on Twitter at @lauren_goss, or Instagram at LaurenGoss.